This exclusive fountain is one you will only find here at Fender’s Fish Hatchery! We’re proud to continue offering this fountain that is a customer past favorite and now, an exclusive here on the farm. 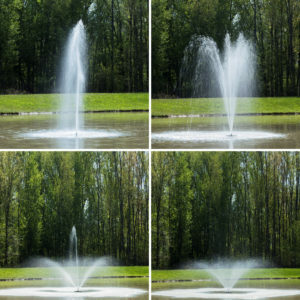 With the asynchronous design it will last longer and stay cleaner, and four unique nozzle patterns allow you to change up your fountain design. 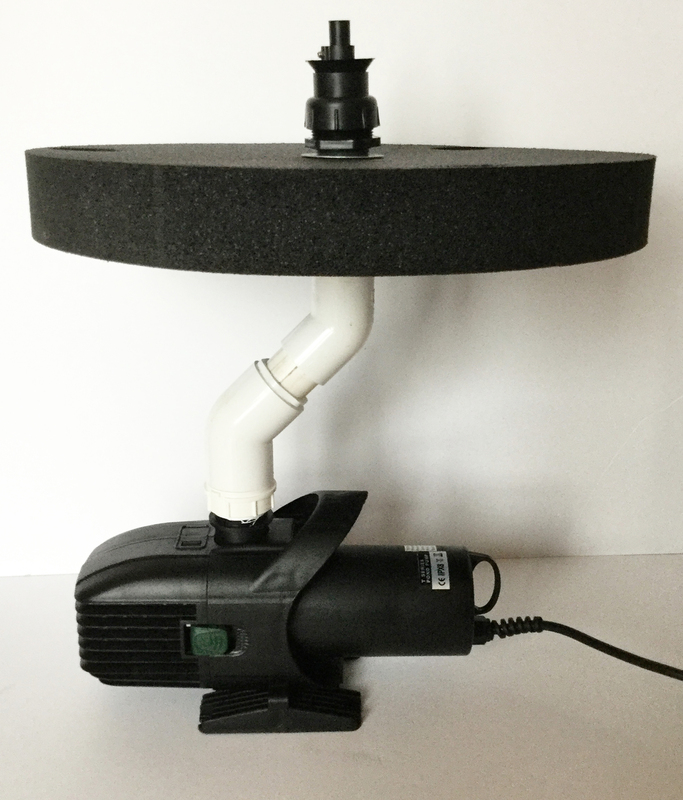 Consider adding our lighting kit to this as well! 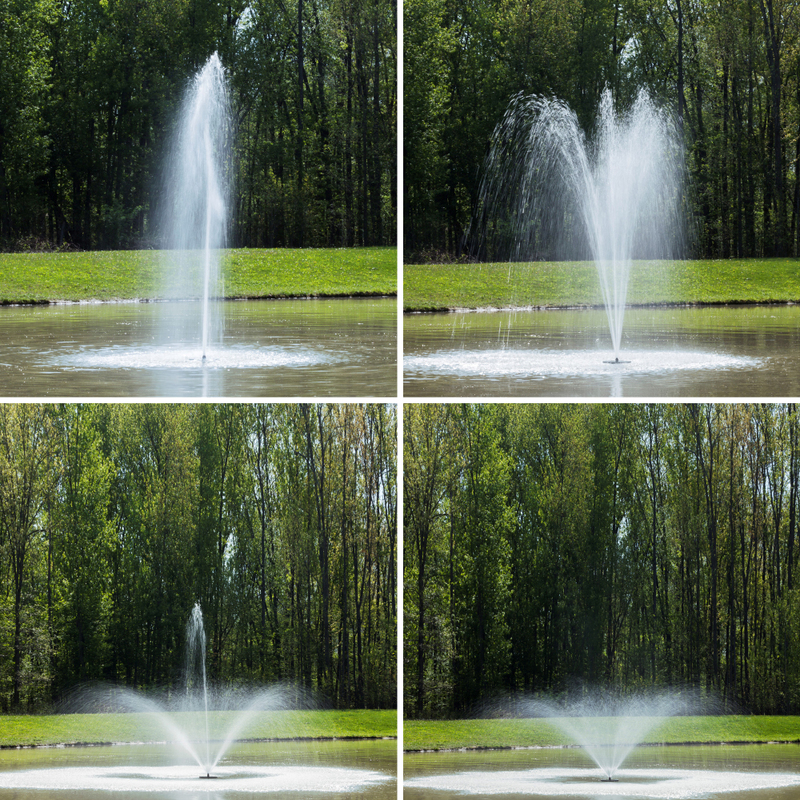 This exclusive fountain is one you will only find here at Fender’s Fish Hatchery! We’re proud to continue offering this fountain that is a customer past favorite and now, an exclusive here on the farm. These new pumps can be cleaned and won’t need tossed out – water with high dirt and mineral concentrations can be detrimental to motor seals but the asynchronous pump design eliminates the possibility of seal failure due to overheating. 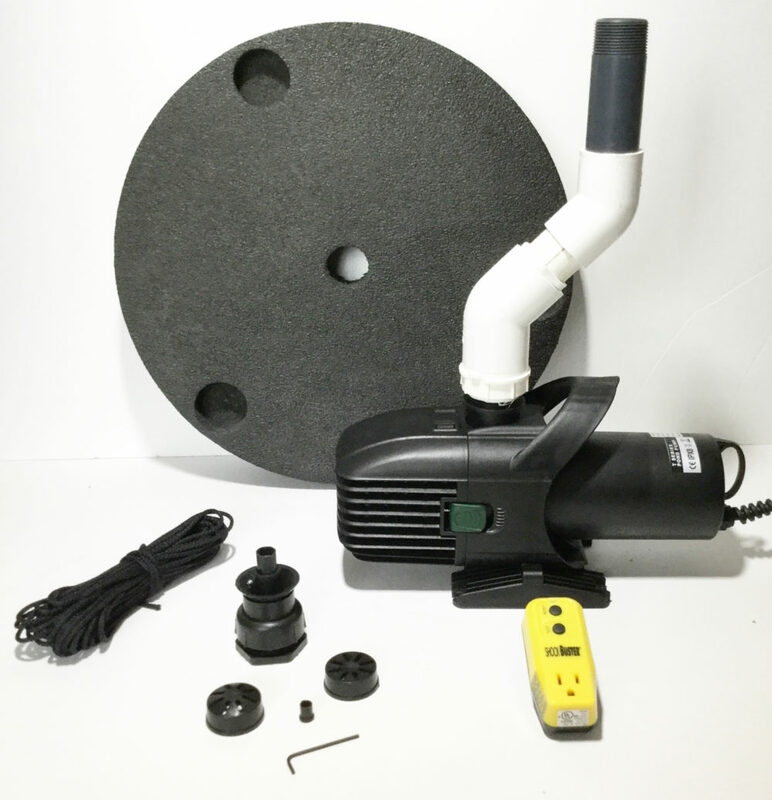 PUMP: 6,077 gallons per hour, 115v, 520 watts, 4.3 AMP, asynchronous, energy efficient, might higher volume than traditional pumps, no motor seals which can wear in dirty/abrasive water. NOZZLES: Four unique nozzle patterns (seen in the photos) are included. Heights are 12-14 feet with widths up to 25 feet. FLOAT: High density 18″ black resilient closed cell plastic foam float, which is water resistant and will not abosrb water. UV resistant as well, and CFC and HCFC free. It will accommodate optional light fixtures. FILTER: Intake screen and debris filter included. GFCI: Ground Fault Circuit Interrupter Electrical Protection included. ANCHORING LINE: 50′ of anchoring line is included. LIGHTING OPTIONS: Easy to install 3 fixture MR-11 light set with both LED and Halogen bulbs can be purchased for an additional cost. MINIMUM WATER DEPTH: AT least 2-3 feet of water recommended. WARRANTY: 1 year limited warranty. The original pump and wire must be returned in its entirety for pump warranty consideration, any deviation from this requirement will void all warranties. 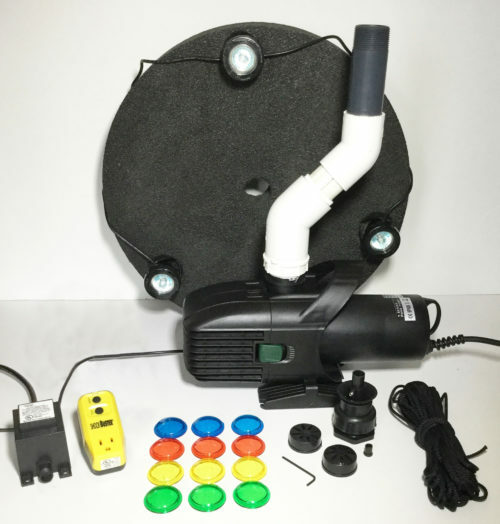 Includes pump, four nozzles, 18″ float, GFCI protection, 50′ anchoring line, intake debris filter, 100′ power cord, and (not pictured) electric eye to turn on with changing of daytime to nighttime.